GoAnimate for Schools app is now available on Schoology! If you’re an educator, you’re probably familiar with school-safe social networks and learning management systems Edmodo and Schoology. And if you’ve been following us for awhile, you may know that we have a GoAnimate for Schools app available on Edmodo. We’re happy to co-announce that we now have one available in Schoology’s app center as well! GoAnimate is the world’s #1 do-it-yourself animated video website, and GoAnimate for Schools is the school-safe version. Our ‘Schools apps allow educators to easily access all of our site’s features from the convenience of their preferred learning management system. 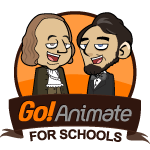 We hope you’ll enjoy the GoAnimate for Schools app on Schoology! Engage Your Students With Video! GoAnimate for Schools makes it simple for teachers and students to make amazing videos! GoAnimate for Schools is widely used for lesson content, teacher and student presentations, tutorials, language training, behavioral training (anti-bullying), special ed, communications for autism/aspergers, plus tech, art and writing. Our Quick Videos are super-simple, structured solutions. A first-timer can be done in 2 minutes. Our Full Videos offer control over the characters, camera and transitions, with easy point & click or drag & drop tools. The learning curve is gentle, but even older kids won’t outgrow this. Dialogue can be entered by mic recording or simply typing into our text to speech tool, which supports over 20 languages. Import your own music, sound effects, props and backgrounds – or use our library of thousands! Grab a character from our library. Or make your own with our Character Creator. ** This app requires a paid subscription to GoAnimate. You can purchase a subscription after you have installed the application to your Schoology account. The subscriptions cost $2 or less per user per year. The minimum size is $99 per year and serves up to 50 users.